baked pasta muffins recipe yields a great snack for kids. They go great as breakfast or as an after school snack. Not only kids, everyone will like them. 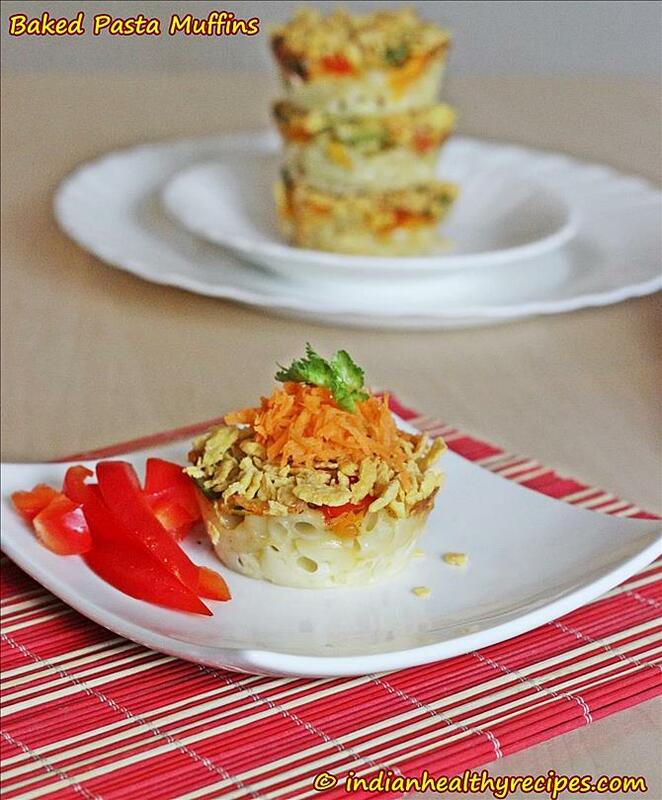 To make the baked pasta muffins, any vegetables of your choice can be used. I have also used crumbled corn flakes to give a crust to the muffin top. Oats or rice crispies can be used as well. 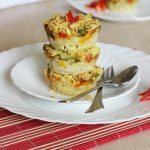 These muffins are layered with cooked pasta at the bottom layer, next layer is cheese which helps to bind the bottom and top layer ingredients. For the top layer I have used chopped veggies and then finished off with crumbled cornflakes. You can play around with whatever ingredients you think will go good to make these baked pasta muffins. baked pasta muffins recipe yields a great snack for kids. Cook pasta as per the instructions on the pack. Rinse and drain and set aside to cool. Chop the veggies. Add salt and pepper. Mix. Grease the muffin tins, add the pasta cheese mix. Add the veggies and then the cheese for binding the corn flakes. Bake for 15 to 18 mins. Wait for 5 mins and scoop them out. Serve baked pasta muffins hot or warm with sauce. 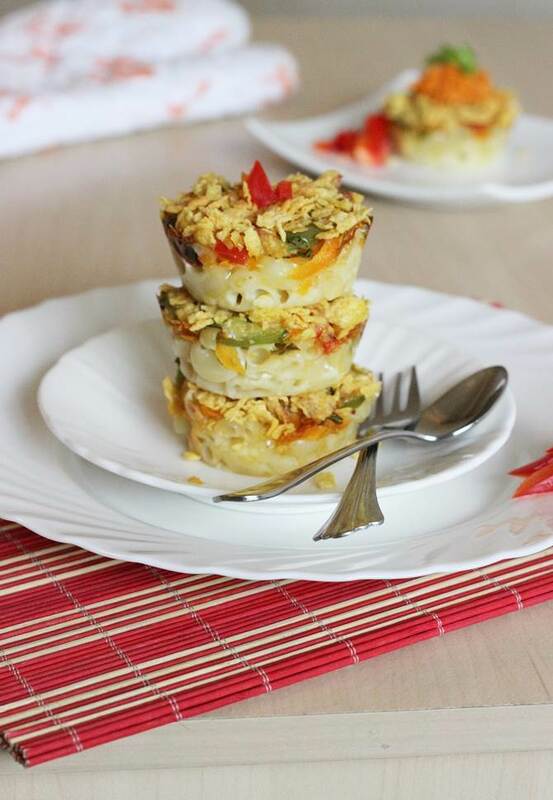 Hi Swasthi – Thank you so much for this yummy recipe! My mom found this while browsing for some new and easy recipes. I helped her make this and it turned out yummy. Kindly let me know your e-mail address so that I can send you a photo. wow….amazing and so tempting they look. Happy New Year to you Swathi…The last pic tempts me to make these fritters immediately. I simply love the way you try out recipes from around the world and bring it to us. Hi Kaveri! i wish you the same dear! Iam so sorry while trying to publish your other comment by mistake got deleted as my kids were around and it happened accidentally. you don&#39;t have to feel sorry for the above comment. There is nothing wrong. yummy.. they r so good..
Hi Swasthi, wow… this is so lovely and delectable. Very impressive. YUMMY!<br /><br />Have a nice week ahead,regards. Interesting and delicious muffins.. Great snack for kids..
wow… fantastic recipe… you always come up with something interesting!! Such an amazing ad fun twist to the traditional pasta. Loved it. Wow dear that looks so colorful and creative…must be delicious too..wonderful clicks. Beautifully done.nice idea.sure kids will enjoy. Super cute muffins, quite a kid&#39;s friendly dish, well done Swasthi. Kids will love this,looks colorful.